صادقی, مهدی, روشندل کاهو, امین, سیاه کوهی, حمیدرضا, حیدریان, علیرضا. (773). شناسایی کانال‌های مدفون با استفاده از روش برانبارش رنگی (RGB). مجله ژئوفیزیک ایران, 6(4), 62-72. مهدی صادقی; امین روشندل کاهو; حمیدرضا سیاه کوهی; علیرضا حیدریان. "شناسایی کانال‌های مدفون با استفاده از روش برانبارش رنگی (RGB)". مجله ژئوفیزیک ایران, 6, 4, 773, 62-72. صادقی, مهدی, روشندل کاهو, امین, سیاه کوهی, حمیدرضا, حیدریان, علیرضا. (773). 'شناسایی کانال‌های مدفون با استفاده از روش برانبارش رنگی (RGB)', مجله ژئوفیزیک ایران, 6(4), pp. 62-72. صادقی, مهدی, روشندل کاهو, امین, سیاه کوهی, حمیدرضا, حیدریان, علیرضا. شناسایی کانال‌های مدفون با استفاده از روش برانبارش رنگی (RGB). 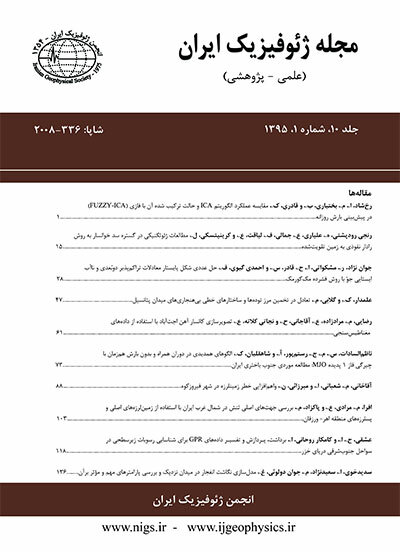 مجله ژئوفیزیک ایران, 773; 6(4): 62-72. تجزیه‌ طیفی داده‌های لرزه‌ای، حجم زیادی از داده‌ در بسامد‌های مختلف تولید می‌نماید که می‌توان آن‌ها را بصورت مکعب‌های تک‌بسامد تجزیه نمود. از این مکعب‌ها که حاوی اطلاعات مفیدی از روند‌های ساختاری و نهشته‌های رسوبی می‌باشند، می‌توان جهت نمایش این روند‌ها استفاده نمود. در این مقاله سه روش نمایش این روند‌ها مورد بررسی قرار می‌گیرد. در روش اول با استفاده از برش‌ زمانی از مکعب‌های تک‌بسامد، تغییرات ناشی از این الگوها نمایش داده می‌شود. در این روش مقاطع تک‌بسامد مختلف بررسی می‌گردند و یک مفسر با تجربه می‌تواند با مشاهده‌ تغییرات این مقاطع با بسامد از تغییرات عرض و محتویات کانال اطلاعاتی بدست آورد. از آنجایی که فرکانس‌های پایین و بالا دارای اطلاعات متفاوتی از رویداد‌ها می‌باشند، تصاویر تک‌بسامد نمی‌توانند اطلاعات مورد نیاز از رویداد را بطور همزمان نمایش دهند. در دو روش دیگر مورد بررسی در این مقاله با استفاده از برانبارش رنگی، مقاطع RGB از این برش‌ها تهیه می‌شود که به دلیل داشتن محتویات بسامدی مختلف دارای اطلاعات بیشتری از نمایش تک‌بسامد می‌باشند. در این مقاله مقاطع RGB به دو صورت RGB معمولی و RGB با توابع پایه تهیه شده است. در روش RGB معمولی با استفاده از سه برش تک‌بسامد مجزا به ازای فرکانس‌های مختلف، مقاطع برانبارش رنگی تهیه می‌گردد. در این حالت اگرچه مشکل روش تصاویر تک‌بسامد تا حدودی برطرف می‌گردد، اما فقط از سه مقطع تک‌بسامدی استفاده شده و در عمل قسمت اعظمی از اطلاعات مقاطع تک‌بسامد دیگر همچنان نادیده گرفته شده‌اند. در روش RGB با توابع پایه با استفاده از پنجره‌هایی محدوده‌های بسامدی خاصی به عنوان مولفه های قرمز، آبی و سبز در نظر گرفته می‌شوند و مقاطع RGB به تصویر درمی‌آیند. مقایسه نتایج این سه روش نمایش برای نمایش کانال‌های مدفون نشان داد که روش برانبارش رنگی نسبت به روش تک‌بسامد با دقت بیشتری کانال‌ها را نشان می‌دهد و همچنین استفاده از توابع پایه بدلیل استفاده از اطلاعات بیشتر نتایج بهتری نسبت به روش RGB معمولی در نمایش کانال‌های مدفون ایجاد می‌کند. Spectral decomposition of time series has a significant role in seismic data processing and interpretations. Since the earth acts as a low-pass filter, it changes the frequency content of the passing seismic waves. Conventional methods of representing signals in a time domain and frequency domain cannot show the time information and the frequency information simultaneously. Time-frequency transforms an upgraded spectral decomposition to a new step and can show time and frequency information simultaneously. Time-frequency transforms generate a high volume of spectral components, which contain useful information about the reservoir and can be decomposed into single frequency volumes. These single frequency volumes can overload the limited space of a computer hard disk and are not easy for an interpreter to investigate them individually; therefore, it is important to use methods to decrease the volume without losing information. The frequency slices are thus separated from these volumes and used for an interpretation. In this study, three different methods were used to represent a buried channel. In the first method, the numbers of the single frequency slices were investigated, variations of the frequency amplitudes in the slices were observed, and an expert interpreter could obtain some information about the channel content and lateral variation. Since different frequencies contain different types of information (low frequencies are sensible to channel content and high frequencies are sensible to channel boundaries), none of the slices were able to show all information simultaneously. In the next two methods using a color stacking method, the RGB plots were constructed which, due to the different frequency content, resulted in more information than the frequency slice representation method. An RGB image, sometimes referred to as a true color image, is an image that defines red, green, and blue color components for each individual pixel and has an intensity between 0 and 1. In this study, RGB plots were constructed in two different manners, RGB plots based on conventional RGB plot methods and RGB plots using basis functions. In the conventional method, three different frequency slices were mapped against the red, green and blue components. Although this method obviates some drawbacks of the single frequency plots, it uses only three slices and practically ignores a big part of information. Using basis functions and defining windows, the interpreter was able to introduce some frequency intervals and plot them against the primary components and use the total bandwidth or its major part. Three simple raised cosine functions having different frequency centers and different periods were chosen. The image quality strongly depended on these two parameters. Longer window widths will introduce longer frequency widths into every primary component and resulted in smoother color combinations for images and very short periods had the same results as the conventional RGB plot method. Different centers showed different details. Low frequency centers showed channel content properties, and high frequency centers showed channel boundaries and fine branches. In this study, the spectral decomposition was first performed on land seismic data from an oil field in Iran using a short time Fourier (STFT) transform and an S transform. Then three demonstration methods were applied for channel detection. Finally it was shown that how RGB color stacking method represented buried channels in more precise images and how a basis function based RGB represents better results than the conventional RGB method. روشندل، ا.، 1388، بهبود تبدیل‌های زمان-فرکانس در مطالعه داده‌های لرزه‌ای، رساله دکتری، موسسه ژئوفیزیک دانشگاه تهران. Askari, R., and Siahkoohi, H. R., 2008, Ground roll attenuation using the S and x-f-k transforms: Geophysical Prospecting, 56, 105-114. Bahorich, M., A. Motsch, K. Laughlin, and G. Partyka, 2002, Amplitude responses image reservoir: Hart’s E & P, January, 59-61. Castagna, J. P., Sun, S., and Siegfried, R. W., 2003, Instantaneous spectral analysis: Detection of low-frequency shadows associated with hydrocarbons: The Leading Edge, 22, 120-127.
Cooper, G. R. J., 2006, Interpreting potential field data using continuous wavelet transforms of their horizontal derivatives: Computers and Geosciences, 32, 984-992. Chopra, S., and Marfurt, K. J., 2005, Seismic attributes -A historical perspective: Geophysics, 70, 3–28. De Oliveira Lyrio, J. C. S., Tenorio, L., and Li, Y., 2004, Efficient automatic denoising of gravity gradiometry data: Geophysics, 69, 772-782. Fahmy, W. A., Matteucci, G., Butters, D., Zhang, J., and Castagna, J., 2005, Successful application of spectral decomposition technology toward drilling of a key offshore development well: 75th SEG meeting, Houston, Expanded Abstracts, 262–264. Fedi, M., and Quarta, T., 1998, Wavelet analysis for the regional residual and local separation of potential field anomalies: Geophysical Prospecting, 46, 507-525. Gabor, D., 1946, Theory of communication: Journal of the Institution of Electrical Engineering, 93, 429-457. Leite, F. E. A., Montagne, R., Corso, G., Vasconcelos, G. L., and Lucena, L. S., 2008, Optimal wavelet filter for suppression of coherent noise with an application to seismic data: Physica A, 387, 1439-1445. Liu, J., and Marfurt, K. J., 2007a, Instantaneous spectral attributes to detect channels: Geophysics, 72(1), 23–31. Liu, J., and Marfurt, K. J., 2007b, Multicolor display of spectral attributes: The Leading Edge, 26, 268–271. Mallat, S., 1999, A wavelet tour of signal processing: Elsevier. Martelet, G., Sailhac, P., Moreau, F., and Diament, M., 2001, Characterization of geological boundaries using 1-D wavelet transform on gravity data: theory and applications to the Himalayas: Geophysics, 66, 1116-1129. Matos, M. C., Osorio, P., Mundim, E. C., and Moraces, M., 2005, Characterization of thin beds through joint time-frequency analysis applied to a turbidite reservoir in Campos Basin, Brazil: 75th SEG meeting, Houston, Expanded Abstracts, 1429–1432. Onstott. G. E., Backus, M. M., Wilson, C. R., and Phillips, J. D., 1984, Color display of offset dependent reflectivity in seismic data: 54th SEG meeting, Atlanta, Expanded Abstracts, 674-675. Roshandel Kahoo, A., and Siahkoohi, H. R., 2009, Random noise suppression from seismic data using time-frequency peak filtering: 71th EAGE meeting, Amsterdam, Extended Abstracts, 317. Sinha, S., Routh, P. S., Anno, P. D., and Castagna, J. P., 2005, Spectral decomposition of seismic data with continuous-wavelet transform: Geophysics, 70, P19-P25. Stark, T. J., 2005, Anomaly detection and visualization using color-stack, cross-plot, and anomalousness volumes: 75th SEG meeting, Houston, Expanded Abstracts, 763–766. Stockwell, R. G., Mansinha, L., and Lowe, R. P., 1996, Localization of the complex spectrum: The S transform: IEEE trans. signal process, 44, 998–1001. Theophanis, S., and Queen, J., 2000, Color display of the localized spectrum: Geophysics, 65, 1330–1340. Ville, J., 1948, Theorie et applications de la notion de signal analytique: Cables et Transm, 2A(1), 61-74.